Update: Google has rebranded the Google Play Newsstand and released it as Google News for Android and iOS. If you already have Google Play Newsstand, you would have received an update, if not you can get it from Google Play Store or the App Store. Google at the I/O 2018 developer conference today announced new Google News, which uses artificial intelligence to find and organize news into storylines by analyzing it in real time. “Google News now understands the people, places and things involved in a story as it evolves, and connects how they relate to one another,” says Google. This lets Google synthesize information and put it together in a way that helps users make sense of what’s happening, and what the impact or reaction has been. “For You” makes it easy to stay up to date on everything you care about all in one place. It offers briefing of five stories that Google News has organized that includes most important headlines, local news and the latest developments on the topics you’re interested in. It learns and gets better as you use. It also has easy-to-use and easy-to-access controls so you can decide if you want to see more or less of a topic or publisher. “Full Coverage” feature provides a complete picture of how that story is reported from a variety of sources. There is also Newsstand tab makes it easy to find and follow the sources, as well as browse and discover new ones. This will replace the Google Play Newsstand on mobile and desktop and the Google News & Weather app on mobile. 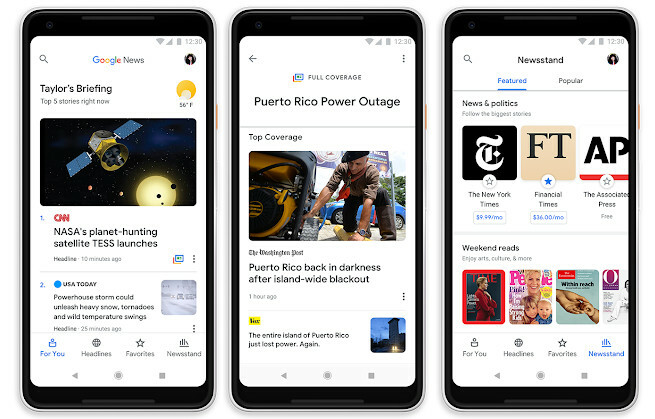 New Google News will start rolling out starting today for Android, iOS and the web and will be available in 127 countries globally by next week.